Today I have a faith-based memoir book review for you. 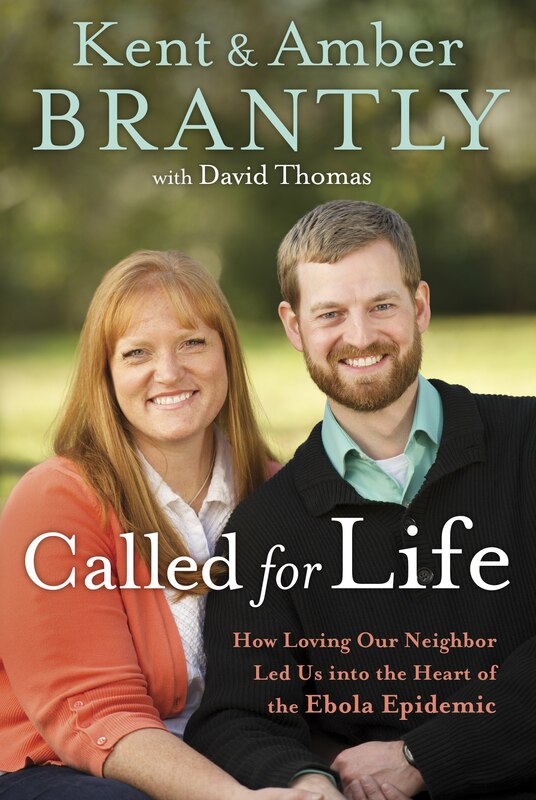 I was so excited to read Kent and Amber Brantly [with David Thomas]’s Called For Life: How Loving Our Neighbor Led Us into the Heart of the Ebola Epidemic, and am grateful to Blogging for Books for offering it in exchange for my honest review. Dr. Kent and Amber Brantly moved with their children to war-torn Liberia in the fall of 2013 to provide medical care for people in great need—to help replace hopelessness with hope. When, less than a year later, Kent contracted the deadly Ebola virus, hope became what he and Amber needed too. When Kent received the diagnosis, he was already alone and in quarantine in the Brantly home in Liberia. Amber and the children had left just days earlier on a trip to the United States. Kent’s personal battle against the horrific Ebola began, and as thousands of people worldwide prayed for his life, a miraculous series of events unfolded. Called for Life tells the riveting inside story of Kent and Amber’s call to serve their neighbors, as well as Kent’s fight for life with Ebola and Amber’s’ struggle to support him from half-a-world away. Most significantly, Called for Life reminds us of the risk, the honor, and the joy to be known when God and others are served without reservation. In a word, this book was captivating. Like many Americans, I followed Kent’s story-and the Ebola epidemic–closely. Unlike many Americans, this felt personal to me. When I was in grad school focusing on African Studies and Library Science at Indiana University, I worked for over three years in the Liberian Collections, an archive dedicated to the preservation of Liberian memory and records. During those years, I met many Liberians, learned about their history and culture, and immersed myself in working to preserve their history. By the time Ebola became international news, I was already living and working in Nashville and all I could think was… something else for Liberia?!? First all the years of war… then all the reconstruction… and now this? I was heartbroken for Liberia and her people and just could see the future, and all that will have to take place to rebuild the country–reputation and all. The story also felt personal because of the local connection. Kent is also from Indiana and went to medical school at the IU campus in Indianapolis. So reading this book was a no-brainer. I just didn’t expect to be captivated by this encouraging and heartbreaking story like I was. Unlike some current history-type memoirs, Called for Life didn’t seem to be sloppy or rushed. I was impressed with the level of care, attention, and detail that seemed to go into the writing and production of this book. The maps were great to help situate readers in Liberia and along the coast of Africa. There was also a good deal of background information about Ebola, Liberia, and medical missions which is helpful to most readers. The timeline did jump around, so it was hard to follow at times, though that did get sorted out by the end. Dates at the beginning of each chapter/subsection would have been helpful. As a Christian called to serve others and share the gospel AND also as an academic who has spent close to a decade learning about Africa, I have long had mixed feelings about international missions, good deeds, and foreign aid, so the ethical part of this book was fascinating. In fact, when Ebola was front-page news and Kent was sick, I spent quite a bit of time reading about the ethics behind his treatment [receiving experimental drugs, being transported out of Liberia to one of the most advanced medical facilities in the world]. It is such a hard subject. Why should Americans receive this kind of care while many Africans died? Why should a medical professional be more privileged than the thousands of others who also suffered–and died–from Ebola? And I don’t have an answer, except to say what the title of this book says: that for whatever reason, God called Kent for life and this–the drugs, the flight, the top-notch care–was how He did it. I wondered if [or how] Kent would address it in this book, and thought he did a wonderful job. He discussed these very concepts in depth throughout the last chapter, and in snippets throughout the book. He came across as very humble and grateful, thankful to the Lord. I know this will be a portion of the book and possibly my review that people who are not Christians may not understand or may not agree with, so I just wanted to say that I know where you are coming from. If you want to discuss it with me, I would be happy to do so. I appreciated how Kent grappled with this and would encourage everyone to read the last chapter of this book before brushing off his story as one of privilege. Aside from being captivating, encouraging, and heartbreaking, this book was also convicting. How do I love my neighbors? How do I serve others? What more could I do if I was willing to follow the Lord more closely? The Brantly family is a great example of this and their story encourages me to pursue this more in my life. All in all, a great book! I read Called for Life in one sitting on a lazy Sunday afternoon, and immediately texted my mom to see if she wanted to read it next. I have a feeling I’ll be recommending it to many people in the future. It would be a great Christmas gift for anyone interested in faith-based memoirs, medicine, missions, or Africa. Hope you can find a copy soon! Disclosure: I received this book for free from Blogging for Books for this review. However, I was not required to write a positive review. The thoughts expressed above are entirely my own. Thanks to Blogging for Books and the publisher, Crown Publishers, for the chance to read this great book! I’m always looking for new books to read so I love these posts! Especially when you give such thorough reviews! !